This is it… the final day of the most EPIC Kindle contest ever. If you haven’t already, head over to the contest blog for this amazing contest and enter today!!! Special thanks to Scott Nicholson, J.R. Rain, Aiden James, and H.T. Night for putting together such an EPIC contest. You have done an amazing job spreading the word. Also, thanks for the unbelievable generosity you have shown in giving away so many free books and other goodies the past few days. It would be absolutely amazing to win the Kindle Fire, but with all the fun I’ve had spreading the word & downloading book after book, I already consider myself a big winner. Now to find time to read all the new treasures! Happy Reading & Good Luck Everyone!!! This book is hard to come by, but there are many, MANY great reads by Scott over at Amazon readily available for your Kindle or Kindle app and if you stop by today and tomorrow you will find a lot of them for absolutely free. So don’t delay… head over to Amazon now! If you haven’t been following all the chaos on Twitter & Facebook for the past week or so regarding the Epic Kindle Giveaway, then you must live in a hole somewhere or completely avoid anything and everything related to books. And if that’s the case… 1) you probably won’t stumble upon this blog post anyway and 2) I feel very, VERY sorry for you! I won’t ramble on and on about how I feel about reading and what you can get out of it, but c’mon people… reading is fun! 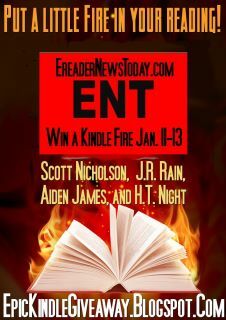 As for those that do like to read… Scott Nicholson, J.R. Rain, Aiden James, and H.T. Night have put together an absolutely amazing contest! They are giving away $1,000 in prizes, including four Kindle Fires, $200 in Amazon gift cards, and 45 free Kindle books. There is a chance, as well, of two more Kindle Fires being added to the mix if we can get their books bumped up to #1 on the Amazon list. And I’m not talking about you having to BUY any books… that’s the even better thing… they are FREE!!! That’s right… absolutely free! If you visit the event blog there is a list of all the FREE books on the left side. Just click through to amazon and “buy” them all right away. If we can get at least one of the books to #1 on the “top 100 free Kindle books” another Kindle Fire is added as a prize. And if we can fill the top 10 spots with books by these authors they’ll put in another. What’s the harm? You get chances at awesome prizes and if nothing else, you have free Kindle books to read.